Ask Your Physio & Chiro Archives - Telma Grant, P.T. The rotator cuff is a set of four muscles of the shoulder. They are so-called because they form a cuff for the shoulder joint. Three are in the back and one is in the front. The rotator cuff muscles connect the shoulder blade to the upper arm, which is the humerus, via tendons. When the tendons become inflamed, the result is rotator cuff tendonitis or inflammation of the tendons. Sports where athletes are particularly prone to rotator cuff tendonitis include golf, baseball, tennis, and swimming. The important thing in treatment with respect to rotator cuff tendonitis is to realize the principle that no muscle operates independently, all muscles work in pairs and they pull against one another like a pulley system. In the shoulder, one of the muscles that work with the rotator cuff is the chest muscles called the pectoralis. 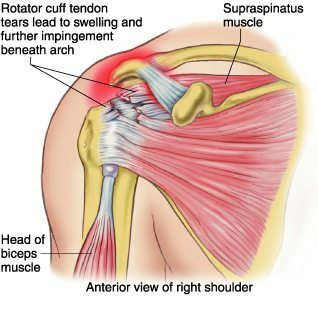 What happens when you get rotator cuff tendonitis is that the length-tension of the muscles, and therefore the tendons have been changed. The most common presentation is that the shoulder joint, or the humerus or upper arm, turns in and forwards. We say it internally rotates and anteriorizes. When this happens, not only is the rotator cuff or tendon painful, but also the chest muscles, or pectorals, form very tight knots in them that keep the rotator cuff from functioning properly. This happens in each and every case where rotator cuff tendonitis results. Therefore, in treatment, simply treating the rotator cuff itself, where the tendon is hurt, is not sufficient to resolve the problem. As much as the tendon is now overstretched, the front of the shoulder joint, because of the chest muscles, or pectoralis muscles, are now over-tightened. Treatment involves restoring the proper length-tension of both sets of muscles, taking out the knots, what we call trigger points, in the chest muscles, as well as treating the inflammation in the rotator cuff tendon. Pitch your rotator cuff injury, call your physio today.